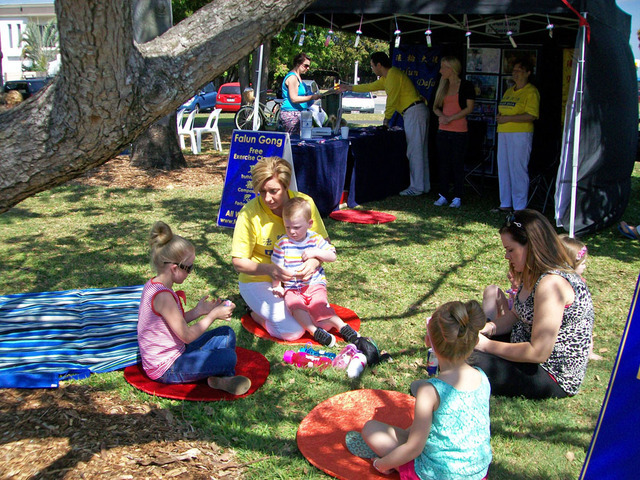 The 2013 Gold Coast Multicultural Festival in Queensland, Australia attracted more than 24,000 visitors to the Evandale Parklands, just a short walk from the Gold Coast City Council’s administration building. 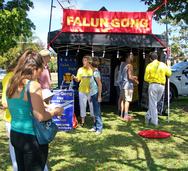 Practitioners displayed Falun Dafa banners and a selection from the "Journey of Falun Dafa" photo exhibit along the walls of their marquee tent. The tent was decorated with origami lotus flowers. Additional lotus flowers were handed out to visitors who stopped to learn more and watch the exercise demonstration in front of the tent. 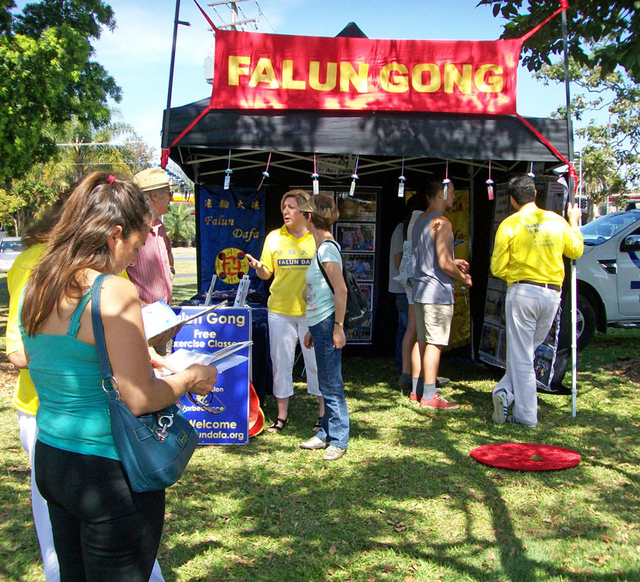 One visitor to the practitioners' booth told them that she had seen Falun Dafa advertised on the city council’s "Active and Healthy" website. She was happy to have the opportunity to meet with practitioners and learn more about the practice. A couple had already heard about the persecution of Falun Dafa in China. Practitioners clarified the truth to them further about the Chinese Communist Party’s involvement in organ harvesting, which has targeted Dafa practitioners and other persecuted groups in China. The couple expressed their support for Falun Dafa and said that they also wished to read Falun Dafa books and gain a deeper understanding of the spiritual teachings of the practice. The practitioners were invited to demonstrate the exercises on the festival stage. After watching the exercises, one woman said she was impressed by a young practitioner who taught her how to make lotus flowers while explaining Dafa’s principles of Truthfulness-Compassion-Forbearance. The woman asked how she could help end the persecution, so practitioners asked her to write a letter to her Member of Parliament and also inform her friends and family members. A Malaysian tourist told practitioners that she had heard some of the Chinese Communist Party's (CCP) propaganda, but recently watched a YouTube video of a practitioner talking about the persecution he suffered in Mainland China. She could not understand why the CCP would do such terrible things and said she has wanted to learn Dafa for a long time. 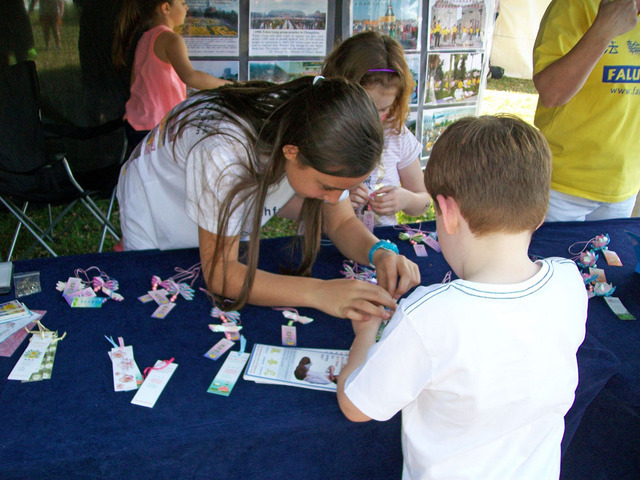 Practitioners gave her details about local practice sites and she said she looked forward to attending. Another woman had a photo taken of her holding a lotus flower next to the “Falun Dafa Is Good” banner. She then started learning the exercises at the event. A group of students from Brisbane told practitioners that they would like to do further research into Dafa for their research into health and wellbeing.